As hip arthritis becomes a growing concern in adults with Down syndrome, clinicians are also becoming more attuned to hip issues in children with DS in hopes that early intervention in the pediatric population will help reduce the risk of disability later on. Based on the numbers alone, hip disorders in children with Down syndrome (DS) don’t seem to be a cause for great concern—it’s estimated that only 5% to 8% of this patient population will suffer from hip impairments, with the most common being subluxation.1 But the detrimental effects of hip disorders can have serious implications, most notably the development of early arthritis. “Fortunately, [hip disorders] in children with Down’s are relatively uncommon. But when it’s bad, it’s bad, so you don’t want to outright dismiss it [as a possibility],” said Stephen England, MD, a pediatric orthopedic surgeon at Park Nicolette Health Partners in St. Louis, MN. 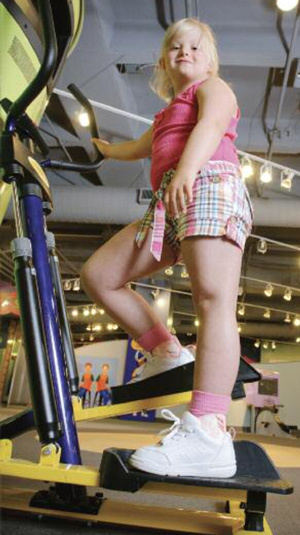 Orthopedic problems are the second most common cause of disability (after cardiac issues) in adult patients with DS, who are living more active, longer lives (See “Down syndrome and total hip arthroplasty: Opportunities to optimize outcomes,” LER March 2015, page 16). “Now that cardiac issues, such as coronary artery disease, are being identified and treated more aggressively, and because the lifespan of children with DS is longer, these [orthopedic] problems will definitely be more of an issue for the adult DS population,” said Stephen Sundberg, MD, a pediatric orthopedic surgeon and program medical director of the Center for Pediatric Orthopedics at Gillette Children’s Specialty Healthcare in St. Paul, MN. LER spoke with Sundberg, England, and other biomechanics experts about the diagnosis and management of hip disorders in children with DS. 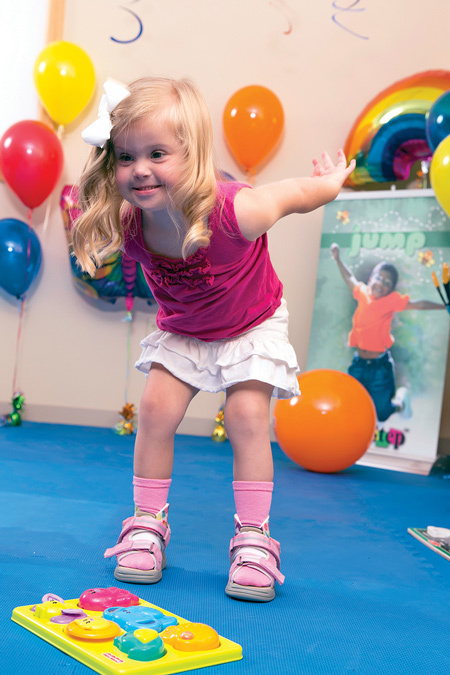 The goal of physical therapy in children with Down syndrome is to “lengthen and strengthen” the muscles so that the hip remains centered in the socket. There are three main reasons for hip disorders in kids with DS. One of the least prevalent is Legg-Calve-Perthes (LCP) disease, where the head of the femur loses blood supply and the bone becomes weak and misshapen. This condition generally manifests in children aged 4 to 8 years as a painless limp and the loss of full range of motion in the hip.1 LCP occurs in children with and without DS, but data on how commonly it’s seen in the latter population are scant, according to England. Finally, there is subluxation, where the head of the femur moves out of the acetabulum. Sundberg described subluxation as a deficiency in the posterior wall of the hip socket in children with DS. “We think that the back wall of the socket is relatively underdeveloped, and that can predispose a small percentage of these kids to develop a progressive hip dislocation,” he said. England added that subluxation can be painless, with the hip joint popping in and out of place. “You or I would no doubt feel that, but for a child with DS, that ability to pop the hip out may become something they are accustomed to,” England said. Sundberg emphasized that practitioners will need input from caregivers and parents to make the correct diagnosis. Martin also stressed obtaining feedback from parents or other caregivers who know the child best. Just as parents can tell whether an infant’s cry means “I’m hungry” or “I’m tired,” they can offer insight into why a child is refusing a routine activity. “They can often discern some of the subtle behaviors that may indicate a physical problem or may just mean, ‘I don’t want to do this today,’” she said. Martin said subluxation is something she sees more often in infants and toddlers than in older children. If a hip disorder is suspected, the child can be sent for an orthopedic exam that may include x-rays. But England cautioned that a static x-ray may show a completely normal hip, as subluxation is a dynamic condition. Sundberg added that assessing hip health in children with DS may require more vigilant observation than in a typical child. Hip subluxation goes through stages; a child may begin life with normal hips but can develop progressive subluxation over the course of many years, he said. Are all children with DS and hip disorders candidates for surgery? There are numerous factors that go into making that call. However, Sundberg said he is not convinced that casting or bracing will keep patients out of the surgical suite. He explained that even with some level of success with nonsurgical methods to reduce subluxation, children with DS will still have progressive migration or shallowness of the hip socket. “They are more than likely to end up needing surgery,” he said. Sundberg said his group has done the procedure in children with DS who were as young as 8 years. Caregivers need to be aware that surgical adjustment of subluxation in childhood is no guarantee that the patients won’t experience hip disorders in adulthood, England pointed out. As with surgery, conservative treatment options for kids with DS and hip disorders depend on the type of impairment and the child’s age. For infants with subluxation, the standard in conservative therapy is the Pavlik harness, which limits range of motion of the hip joint. Unlike a rigid cast, the harness allows the child to move freely within a certain range. When it comes to getting the most out of noninvasive treatments, Martin said, “the earlier, the better,” as the development of the acetabulum is limited after the first 18 months of life. Of course, physical therapy (PT) is paramount for all patients, experts say, regardless of whether they’ve undergone correction with surgery, bracing, or casting. The hypotonia or hypermobility that predisposes children with DS to hip disorders also is often manifested in the foot.12,13 Making the connection between better foot health and better hip health in the DS population has been a shortcoming in the medical community, according to Louis DeCaro, DPM, of the DeCaro Total Foot Care Center in West Hatfield, MA, who is also president of the American College of Foot and Ankle Pediatrics. “I think that there are certainly many specialists that don’t consider the significant impact of the foot on short- or long-term hip health. I think that they see a lot of [kids with DS] where they make judgment calls about the hips, but don’t realize that the foundation has not been addressed well,” he said. Martin agreed that addressing foot impairments in children with DS may often go unexamined, especially by general medicine practitioners. 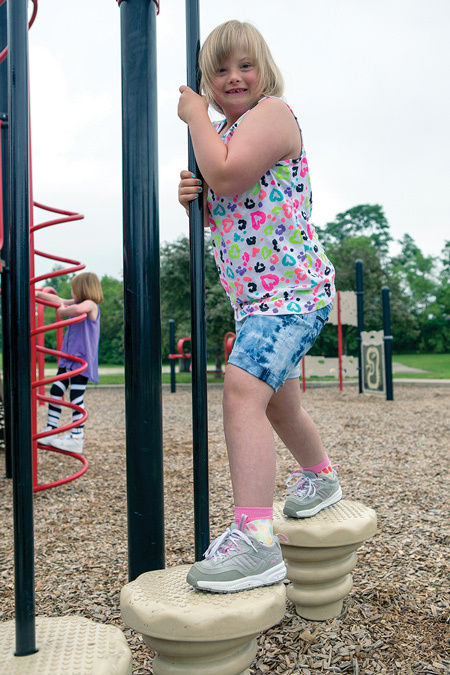 “I think [addressing the feet] is becoming more common, with the idea of providing support as soon as kids with DS are showing interest in getting on their feet, but it’s PTs and developmental pediatricians who are initiating that,” she said. Treatment options for foot problems in children with DS include flexible supramalleolar orthoses (SMO) or custom foot ankle orthoses. The overall goal with orthoses is to improve coordination, balance, posture, and stability during gait, DeCaro said. 1. Leshin L. Musculoskeletal Disorders in Down Syndrome website. http://www.ds-health.com/ortho.htm. Accessed May 4, 2015. 2. Hip dysplasia. Stanford University School of Medicine website. http://newborns.stanford.edu/HipDysplasia.html#management. Accessed May 4, 2015. 3. Jackson JC, Runge MM, Nye NS. Common questions about developmental dysplasia of the hip. Am Fam Physician 2014;90(12):843-850. 5. Caird MS, Wills BPD, Dormans JP. Down syndrome in children: the role of the orthopaedic surgeon. J Am Acad Orthop Surg 2006;14(11):610-619. 6. De la Rocha A, Sucato DJ, Tulchin K, et al. Treatment of adolescents with a periacetabular osteotomy after previous pelvic surgery. Clin Orthop Relat Res 2012;470(9):2583-2590. 7. Katz DA, Kim YJ, Millis MB. Periacetabular osteotomy in patients with Down’s syndrome. J Bone Joint Surg Br 2005;87(4):544-547. 8. Atalar H, Sayli U, Yavuz OY, et al. Indicators of successful use of the Pavlik harness in infants with developmental dysplasia of the hip. Int Orthop 2007;31(2):145-150. 9. Walton MJ, Isaacson Z, McMillan D, et al. The success of management with the Pavlik harness for developmental dysplasia of the hip using a United Kingdom screening programme and ultrasound-guided supervision. J Bone Joint Surg Br 2010;92(7):1013-1016. 10. Pinheiro PC. Nonoperative treatment of slipped capital femoral epiphysis: a scientific study. J Orthop Surg Res 2011;6:10. 11. A patient’s guide to slipped capital femoral epiphysis. OrthoPediatrics website. http://www.orthopediatrics.com/docs/Guides/slipped_CFE.html. Accessed May 4, 2015. 12. Aprin H, Zink WP, Hall JE. Management of dislocation of the hip in Down syndrome. J Pediatr Orthop 1985;5(4):428-431. 13. Adib N, Davies K, Grahame R, et al. Joint hypermobility syndrome in childhood. A not so benign multisystem disorder? Rheumatology 2005;44(6):744-750. 14. Quanbeck D, Greer K, Wilkins K. Joint hypermobility: normal variation or cause of concern? Gillette Children’s Specialty Healthcare: A Pediatric Perspective 2013;22(1):1-3. 15. Martin K. Effects of supramalleolar orthoses on postural stability in children with Down syndrome Dev Med Child Neuro 2004;46(6):406-411. 16. Selby-Silverstein L, Hillstrom HJ, Palisano RJ. The effect of foot orthoses on standing foot posture and gait of young children with Down syndrome. NeuroRehabilitation 2001;16(3):183-193.